Let’s start with January 1st. This was the day I planned to run a race with Brittany to start off the new year. Brittany left me in charge of planning. I did a terrible job and we missed the race entirely. I thought the race was at 3pm, which I questioned to myself. I told Brittany that the race was at 3pm and she trusted me. The race was not at 3pm. For the past year or more I’ve messed up or forgotten important race details. Honestly, it’s only because of Brittany that I’ve made it to any starting lines. I can’t even begin to describe how oblivious I was with running and racing in 2015. Apparently, 2016 isn’t starting any better. The only race goals I have are to know what time the races start! Sunday I started to get a sore throat. So, I made Gatorade Popsicles. I also cleaned out lots of drawers and cabinets and went on a decluttering binge. My mom will be getting a stack of her bowls and dishes back this weekend. It’s a pretty nice collection. I’ve been collecting them for about 4 1/2 years now, but since they aren’t mine returning them is the right thing to do. Now, back to the Popsicles. I love blue Gatorade and I found a Popsicle tray so I made Popsicles. It also got extremely cold this week so the Popsicles made me freeze and shiver. FYI, Popsicles and winter don’t go well together. By Tuesday I couldn’t breathe and I was pretty sick so I left work early and stayed home sick Wednesday. I decided to eat/make more Popsicles. This was the best worst idea I ever had. Cold. Cold. Cold. Thursday was not the best day of my life. First, I received a very disturbing email stating that my research advisor was leaving to take a new position at a different university. This is awesome for him and not so awesome for me. I’m sure this will all get sorted out but I can’t help but be sad and frustrated. Thursday evening I had scheduled a vet appointment for my cats. I only did this because I care about them and want them to be healthy, even humans are supposed to get a check up annually. Junior hasn’t been to the vet in 3 years because he won’t go near the carrier. We’ve done everything but he’s impossible. Thursday night we gave him treats, catnip, and a shoelace. He freaked out and another appointment was canceled. The vet tech asked me if I could hold him in my arms and bring him without a carrier. Clearly, she’s never met Junior. If she had she would know he has an irrational fear of the outdoors. We will now be switching to a vet that makes house calls. Junior won once again. 2016 has been an adventure so far and it can only get better from here! I got a travel mug for Christmas. This is noteworthy because for the last year I was putting coffee in my water bottle. Now, after I drink my 20 ounces of coffee I’ve been putting water in the travel mug. 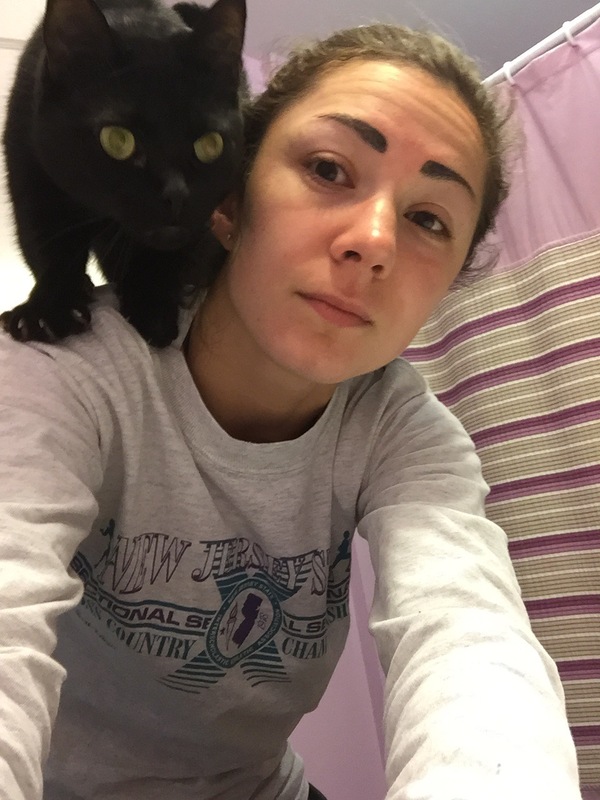 Ninja jumped on my shoulders one morning when I was trying to wash my face. I started watching Gilmore Girls, again. Phil and I have become obsessed with watching old game shows on the BUZZR channel. I can say I haven’t gone to the grocery store, bank, or post office (all errands I despise) all year and then laugh at these jokes. This post made me laugh. Ninja is so Ninja. And you are a good cat mom. I hope you are feeling better!